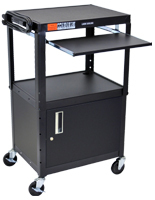 This AV Cart with Utility Cabinet is Ideal for Any School or Office. 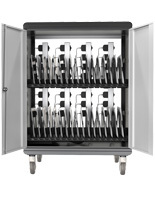 Each Stand Features a Locking Multimedia Cabinet that Keeps Items Safe. Each AV Cart Features (4) Wheels for Increased Portability. 4) Rolling Casters, including (2) locking wheels for smooth transportation. Locking utility cabinet for secure storage of needed audio visual equipment. Adjusts in height from 24"h-42" for ideal top shelf access. Safety mat on top shelf and 1/4" retaining lip help prevent items from falling while in motion. 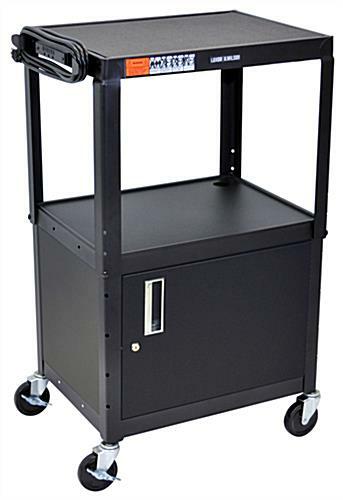 This portable trolley, an AV cart with a locking media cabinet, is constructed of durable metal with an attractive powder coat finish in black. Each mobile trolley stands 24" high and adjusts in height to 42" in 2" increments. This adjustable height AV cart with media cabinet provides a great way to transport and store audio visual devices in an efficient way. 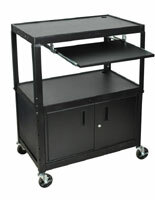 The secure locking storage case on the bottom of the trolley is constructed of 20 gauge steel and has ample space, measuring 17-1/2"D x 24"W x 16-5/8"H. Customers choose this mobile AV cart with media cabinet that is adjustable in height since the unit offers enough space to transport all necessary multimedia devices. Each steel portable trolley features (2) shelves measuring 24"W x 18"D that feature a 1/4" lip around the perimeter that helps keep items from rolling off. Each AV cart with media cabinet has an added textured anti-slip pad that can be placed on the top shelf which helps to prevent items from slipping when the trolley is in motion. Made in the United States, this mobile trolley is built to last! Each portable trolley is made in the United States and is built to last! 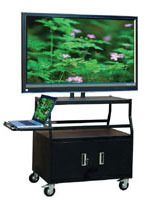 This AV cart with media cabinet that is great for schools and professional settings features (4) 4" ball bearing casters, two with locking brakes, which allow the portable storage stand to glide easily over most floor surfaces. Highly portable, this unit is ideal for environments where audio visual equipment is shared and needs to move to multiple locations. Each AV cart with media cabinet that locks securely, including mobile trolleys, have a cable management hole that keeps all cables neat and tidy when in use or in storage. As an added feature, a 3-outlet 15' UL and CSA listed electric assemble provides one convenient power source for up to 3 devices at one time! This AV cart with media cabinet that has a 15' extension cord is great for complex presentations where multiple pieces of audio visual equipment needs to be used at the same time. Stay organized and transport equipment with ease and efficiency with this adjustable height storage furniture! 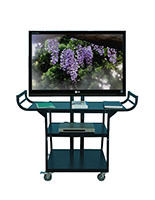 Each AV cart with media cabinet is sure to meet all portability needs! Manufacturer model #AVJ42C. 24.0" x 16.6" x 17.5"